For the past few years the automotive industry has seen a trend towards lead follow-up by email, after all it can be automated, personalised and measured. And with the right program you can guarantee that 100% of leads are responded to. But does responding to a lead by email help to move customers along in their decision-making process? TrackBack recently conducted a study of lead follow-up activity for the major car brands across Europe. This study measured the response rates by telephone and email to test drive requests made on car manufacturer websites. In almost every case, a ‘thank you for your enquiry’ email was received within a few minutes, and in the main these emails had been personalised with the use of customer name and the stated model of interest . At first glance, these emails appear to have been sent by a sales person, with links to the Dealer’s website and social media accounts along with video content, and sometimes a brochure attached. Unfortunately it was also clear that nearly all of the email responses were automated and it showed. Furthermore, in many cases the email responses were obviously sent from generic (not brand or Dealer specific) email accounts and not from real sales team email accounts – not the best way to gain a customer’s trust and build a good relationship. Perhaps the most surprising and disappointing aspect of these email responses, was that a large number of them asked the customer to “Please call and arrange your test drive”. In terms of the customer experience, placing the onus on the customer to call the dealer after they had just spent time and effort to complete an online test drive form with a request to be contacted seems counterproductive and ultimately, frustrating for the customer! It is this failure to take ownership of the contact process and put the ball back in the customer’s court that is the biggest problem with email follow-up. The immediate engagement that can be gained from a good quality telephone call is missing and this can be the difference between gaining an appointment and not. 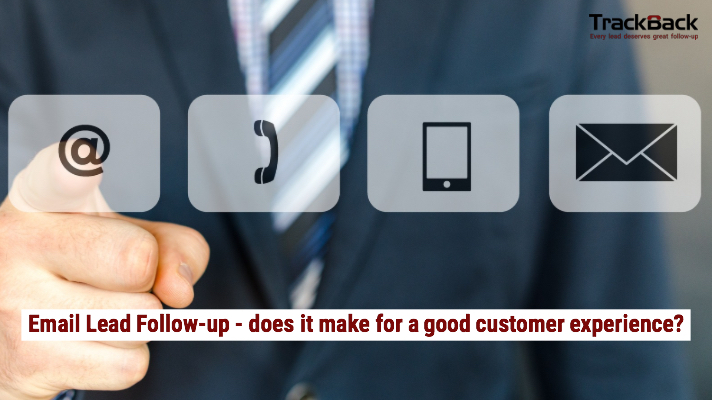 It seems clear to us that reliance on email follow-up only is a significant missed opportunity. Whilst it is certainly true that not all customers will provide both a contact telephone number and an email address when completing online forms, it seems fairly obvious that if they have, then the sales team should attempt to contact using both methods of communication. All 700 leads that were submitted and analysed provided both a contact telephone number and an email address. The overall results told a familiar story. Our study highlighted one market that responded to 91% of their leads by email, but only 57% then received a telephone call. In the UK, which is considered a relatively developed and efficient market, the telephone lead follow-up rate for brands not using TrackBack was only 67%. So there is much room for improvement in lead follow-up across the automotive industry. At TrackBack we work closely with our clients to help track and improve dealer lead follow-up activity by telephone and email, both from a quantitative and qualitative perspective.